Cracked Sidewalks: Crean to hold Book Signing TODAY. 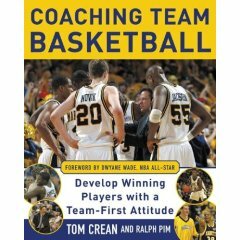 Tom Crean will hold a book signing TODAY for his new book, Coaching Team Basketball: Develop Winning Players with a Team-First Attitude, Saturday, November 4 at 2 p.m., at the Borders Book Store in Fox Point. I guess I know where I'll be at 2pm. I'll wear something gold. Say hello. Update: I went, and it was awesome. My notes can be found here.